Because of their large size and flashy colors, flamingos capture the imagination of bird lovers and wildlife observers. And because some of the species in this family are facing threats to their survival, flamingos are often featured in the news. Here are some stories featuring these big pink beauties in the past few months. A zoo in the path of Hurricane Florence prepares for the coming storm by moving flamingos to indoor enclosures for safety. See video of the pink birds as they get ready to hunker down at the Columbia, South Carolina zoo. Learn about how flamingos in zoos spend their time after visitors have gone for the day in this scientific study press release. For the first time in 15 years, Andean Flamingos are breeding in a wildlife reserve in Britain. Read about the work the Wildfowl and Wetlands Trust is Slimbridge is doing to help endangered species of flamingo. A Greater Flamingo that escaped a Kansas zoo in 2005 is living life as a free bird in Texas. Read about the Old World flamingo's life in the New World. Read about the comeback of the American Flamingo in the Bahamas, in part thanks to the preservation of habitat in Great Inagua National Park. This article includes some fabulous photographs of the species in wild habitats. It's another flamingo baby boom! Learn about how flamingos are doing in Spain. Red-tailed Hawk: New White House Groundskeeper? Earlier this week, the White House reported the sighting of a new guest on their famous grounds -- a juvenile Red-tailed Hawk. Red-tailed Hawks are abundant across the United States, and have adapted well to developed areas. Pale Male, New York City's famous hawk, is an example of the large raptor thriving in an urban environment (he and his mate have three young that are about to fledge from their famous nest). The appearance of a predator on the White House grounds is a good sign for visiting birders, but not so good for any resident rodents living on the property. Red-tailed Hawks prey upon mice, rats, voles, rabbits, and other mammals, as well as other birds, reptiles, and amphibians. This raptor might just earn a spot as a groundskeeper 1600 Pennsylvania Avenue. Fun Fact: Did you know that the Red-tailed Hawk makes a raspy call that is almost always used in popular media as the voice of our national bird, the Bald Eagle? How appropriate would it be to hear the majestic cry of the Red-tailed Hawk while visiting the White House? A Barred Owl in Bush's Pasture Park in the town of Salem, Oregon, has been stealing hats from joggers. The hat-loving owl swoops down and snatches hats right off the heads of unsuspecting runners. At least four people have been victimized in the last few weeks and are now forced to buy new hats. One of the runners named Hilliard told Reuters that he was not hurt in the assault but "just dumbfounded". 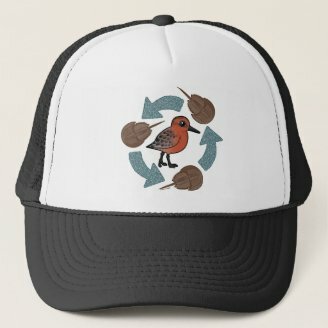 He said: "It was kind of amazing how it just swooped down and grabbed my hat like that. It just pulled it right off my head like it was nothing!" The Stateman Journal, a local newspaper, asked their readers to send in names for the now-famous owl and they received more than 100 different suggestions. Our favorites are Hoodini and Owlcapone. The story of the Salem owl has been covered in the news across the country and even made it on the Rachel Maddow show where viewers were challenged to design a new owl warning sign. 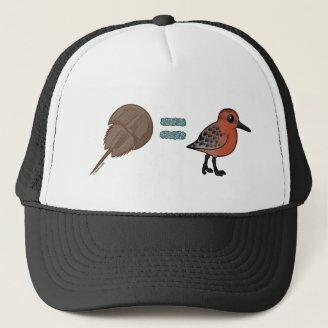 The bird is believed to be collecting the hats to build a nest. Owls can be territorial and aggressive during nesting season. A new sign in the park now warns people to use caution from dusk to dawn and recommends people to wear a hard hat. In a recent research study, it was discovered that cockatoos would exhibit self-control in order to receive a prized nut. Self-control was previously thought to be exclusively practiced by animals with larger brains. Researchers at the University of Vienna gave Goffin's Cockatoos pecan nuts. The birds that waited up to 80 seconds were able to trade up for a more tasty prize: a cashew nut. Here is a video of one of the Goffin's Cockatoos that participated in the study, Muppet, impatiently waiting for his cashew. To learn more about the study, read further here: These bird brains exercise some self-control. A recent study involving Eurasian Jays found that the birds, related to Blue Jays and crows, demonstrate an aspect of intelligence previously thought only to exist in humans. 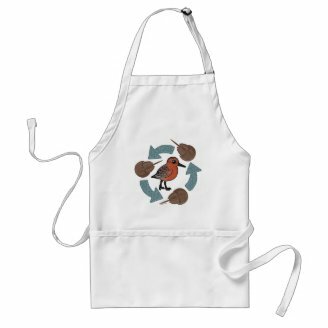 Male Eurasian Jays present their mates with gifts as part of their natural pair-bonding behavior. In the study, male jays were given the option to present their mates with a gift of a mealworm larvae or a moth larvae. The male would observe the female bird eating either moth larvae or mealworm larvae, and depending on which the female had been eating, the male would offer her the other. 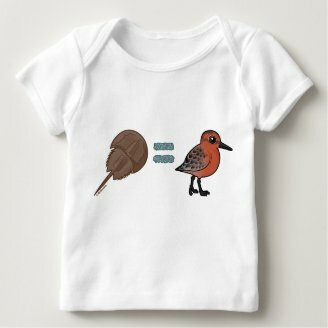 The idea is that a "jay that’s gorged on moths will generally prefer to eat mealworms afterwards, and vice versa, just as a [human] satiated by chocolate will next take a slice of cake." This type of awareness of the feelings of others is called "theory of mind" and it was once believed that only humans had this kind of knowledge. You can read more about the study and see a short video of the experiment here: Gift-Giving Birds May Think Much Like People. 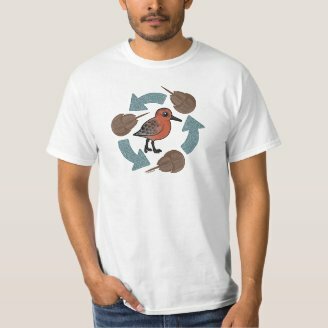 The New York Times reported last week that the number of Red Knots stopping at critical refueling grounds on the East Coast of the United States this year was double the number seen last year. 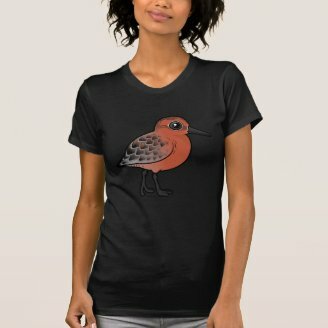 Each year, Red Knots migrate over 9,000 miles during their migration from South America to their breeding grounds in the Arctic Circle. Along the way, they stop at beaches of the East Coast to feed on horseshoe crab eggs to fuel their remaining journey. 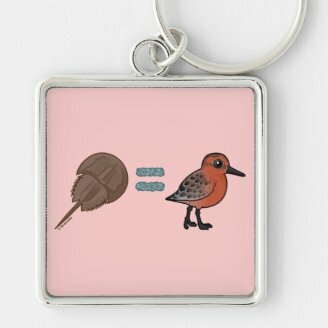 Legislation protecting horseshoe crabs has probably contributed to the good number of Red Knots found this year. 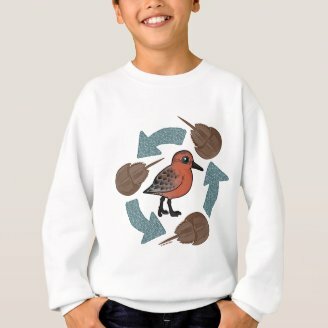 The population of the American subspecies of the Red Knot has been in steep decline; hopefully this year's bounty is a good sign towards recovery! 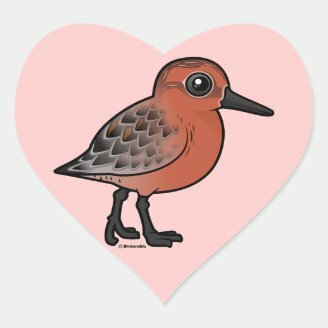 The Red Knot is one of our 378 cute Birdorable birds. 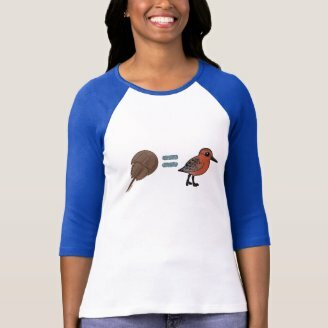 We have commemorated the special relationship between the knots and horseshoe crabs with two unique designs. 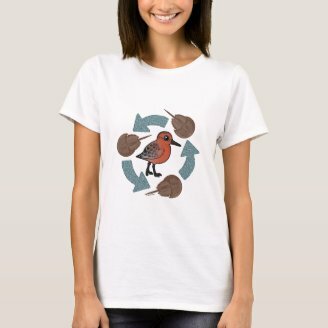 Check them out: Crab-Knot Cycle and Horseshoe Crabs are Life. The small blue blobs making shapes in each design represent horseshoe crab eggs! 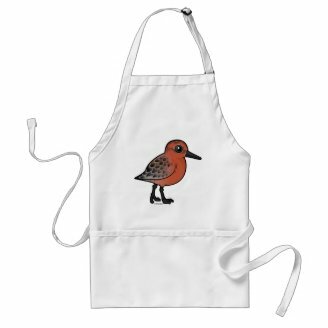 You can learn more about the Red Knot from Cornell's All About Birds website: Red Knot. Hat tip to the ABA Blog for this story.